On July 24th, Google announced the worldwide release of Dynamic Sitelinks – the newest addition to Google’s automatically generated extensions - similar to that of seller reviews or consumer ratings annotations. 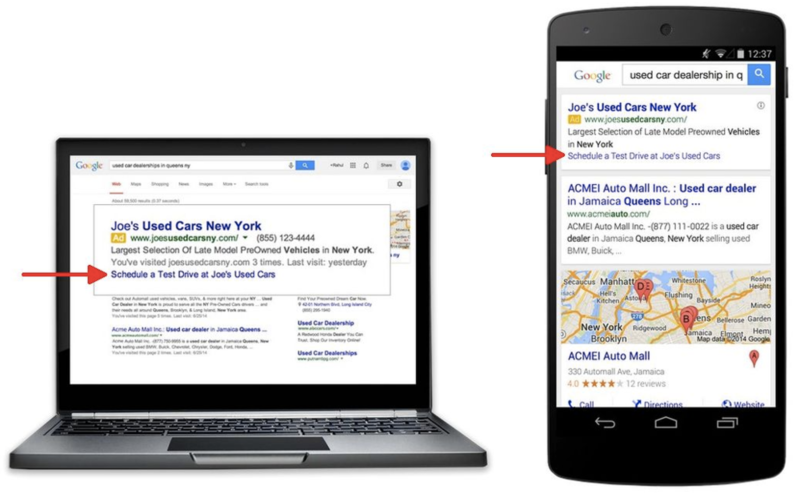 Dynamic sitelinks are automatically generated links that will appear below relevant ads. They can show as a call to action, but won’t always include one. These will link to a relevant page on the advertisers site where either the action can be easily completed or the information is present. Dynamic Sitelinks can show across all verticals for all advertisers, however, these are more likely to show when it is apparent that someone is shopping, planning a trip or doing other types of research via search. Clicks on dynamic sitelinks are free for the time being. A click on the headline of the ad will still be charged on a CPC basis. Dynamic Sitelinks and other sitelinks will not show at the same time. If you currently have sitelinks running at the campaign or ad group level, these will always show, except in the case where Dynamic Sitelinks can perform better. As long as your campaign type is set to ‘Search Network with Display’ or ‘Search Network Only’ your ads are automatically eligible to display dynamic sitelinks. Per the usual with betas and new releases, reporting is very limited at this point in time. If you would like to opt out of this feature, you can use this form. While this is a great opportunity for some advertisers to increase CTR, it doesn’t necessarily make sense for all advertisers – especially those who are extremely conscious about their messaging and voice. For these advertisers, the limitations in the content shown and the pages linked to could be a major concern. In addition, Google’s current limited reporting features makes it impossible to see the messaging created or the pages they link to unless you happen to see an ad 'in the wild'. With the limited amount of volume, it may also be hard to get a good understanding of how these affect overall campaign performance, if at all. Bottom Line: This could be an interesting opportunity for some brands, but for those advertisers who are more hands on, or are have strict branding rules, this may be one feature to hold back on until more options are available.